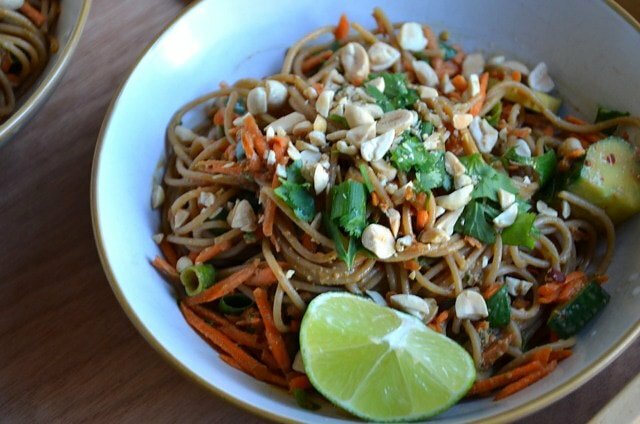 This vegan cold Asian noodle salad with spicy peanut sauce is easy to make with simple ingredients but is packed with flavor. You can make it with regular pasta, soba noodles, zucchini noodles or even spaghetti squash for a lower carb and gluten-free option. 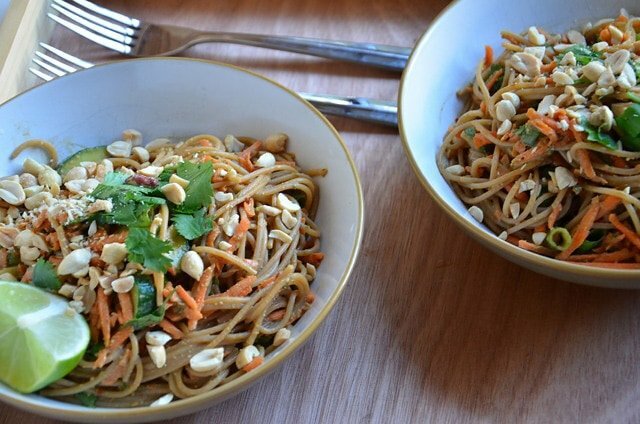 Let’s look at some of the nutrition benefits of this Asian noodle salad. Cilantro is a herb I use a lot but I don’t know if I’ve ever talked about its nutrition benefits. Cilantro (coriander) has been studied for its antimicrobial, anti-anxiety action and cholesterol-lowering effects. This study found that cilantro contains phytochemicals that could protect your heart from oxidative damage, helping to keep it healthy. In this animal study, cilantro was shown to be effective for lowering blood sugar, which lead researches to suggest cilantro to help manage diabetes. This study in mice found cilantro to be as effective as some anti-anxiety drugs. Overall, cilantro is rich in phytonutrients, flavonoids and phenolic compounds and is a source of vitamin A, K, folate and potassium. I primarily use cilantro in salads and curries but it’s also great for making sauces, pesto and adding to smoothies. I have a whole post dedicated to the health benefits of whole grains. You can read all about them here. 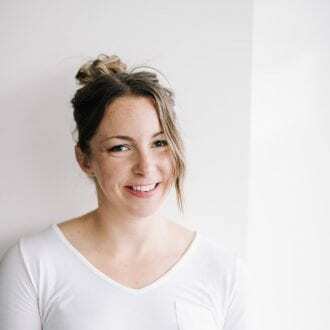 To recap, whole grains are a great source of fiber, most of which comes from bran which is why refined grains that have the bran removed lose so much of their nutrition. They’re also rich in B vitamins such as niacin, thiamin, and folate and contain important minerals such as zinc, iron, and magnesium. The fiber content of whole grains is one of the best reasons to eat them. Fiber feeds the good bacteria in our gut, keeping them healthy and diverse. Whole grains are also low glycemic, meaning they don’t cause a spike in blood sugar like refined grains can and they contain a range of powerful antioxidants. I used whole-wheat pasta in this recipe but brown rice, buckwheat or quinoa pasta would also make a great choice. 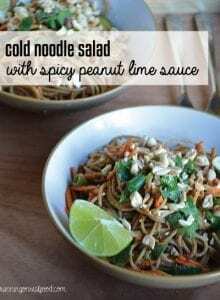 This fresh and flavourful noodle salad is easy to make and can be ready in about 20 minutes, making it perfect for busy weeknights. Plus, it’s even better the next day so feel free to make it ahead of time or pack it up for healthy weekday lunches. You can play around with the veggies in this recipe based on your preference or what you have on hand. I kept it simple with cucumber, red cabbage, green onion, and carrot but finely chopped napa cabbage, finely sliced bell peppers, bean sprouts or steamed broccoli also make great additions. Additional protein add-ins may include baked tofu, tempeh or edamame. Fresh chopped mango also makes a yummy addition. 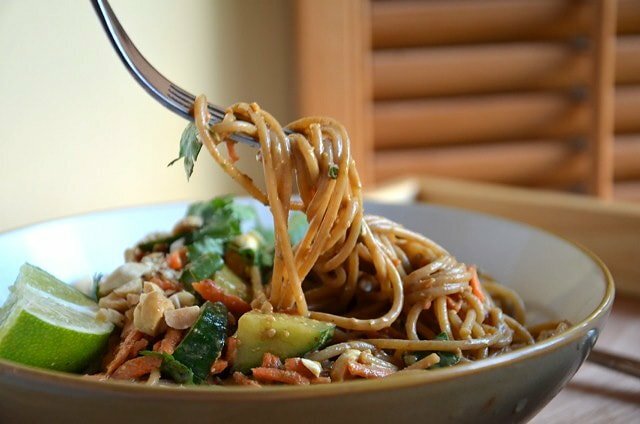 As for the noodles, you can use any type of spaghetti, linguine or fettuccine such as whole-wheat, brown rice, regular wheat, soba noodles, buckwheat noodles or chickpea pasta. Zucchini noodles and spaghetti squash work well for a lower-carb option. You can also use chow mein noodles or rice noodles, cooked according to package instructions. You can use almond butter or sunflower seed butter instead of peanut butter in the sauce recipe. The best thing about this Asian noodle salad is it can be ready in 20 minutes, yet it feels like something that took much longer. Preparing the vegetables and sauce while the noodles cook saves time, making it a perfect meal for busy weeknights. While your pasta noodles are cooking, chop the cucumbers, green onion and cilantro and grate the carrot. Place in a large bowl. Place all the ingredients for the sauce in a blender and mix. Once the noodles are done, rinse under cold water and then add to the vegetables. Pour the sauce over the noodles and vegetables and mix well. Serve topped with peanuts, cilantro and lime. The original recipe didn’t include red cabbage so feel free to leave it out. I added it when I updated this recipe for some extra nutrition and colour. This can easily be adjusted to make 2-4 servings. Simple make as much pasta as you want, use a bit less veggies, top with desired amount of sauce then store any extra in the fridge for dipping tofu in, using on another salad or stirfry or in a wrap. I LOVE cold noodle salads! And with a peanut sauce? Triple bonus! Made this today, it’s amazingly delicious. Thank you for the recipe. Deryn, this was a great dish! Your proportions were accurate and my entire family enjoyed this dish. Thanks! I am excited about these flavors. I have shared this recipe on my July Real Food Meal Plan.